The study, titled “Are Slope Streaks Indicative of Global?Scale Aqueous Processes on Contemporary Mars?“, recently appeared in the Reviews of Geophysics, a publication maintained by the American Geological Union (AGU). The study was conducted by Anshuman Bhardwaj and his colleagues, all of whom hail from the Luleå University of Technology in Sweden. 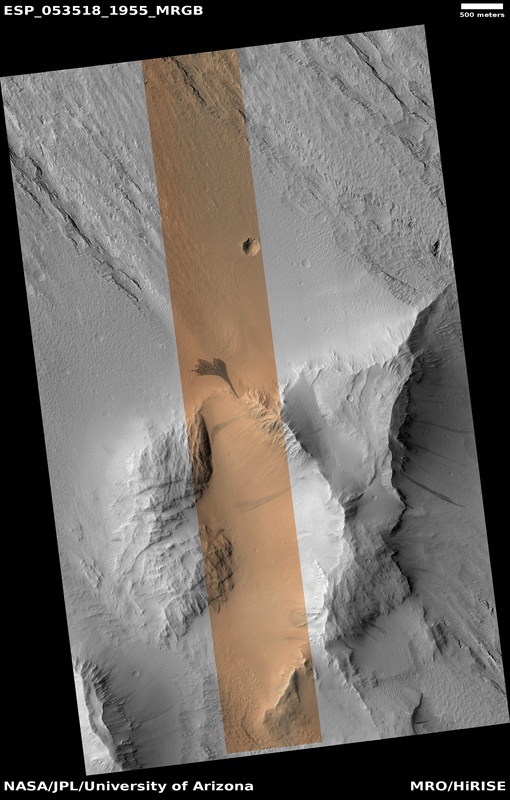 Despite the progress that has been made in studying these features, the scientific community remains divided into two camps when it comes to what causes Martian slope streaks. Those who belong to the “wet” mechanism school of thought believe that liquid water could be responsible for their creation, possibly as a result of groundwater springs, melting surface ice, or the formation of brines (salt solutions). In contrast, those who fall into the “dry” mechanism school theorize that dust avalanches are responsible. These, in turn, could be caused by air fall deposits, subsurface melting, or localized disturbances – ranging by rockfalls, meteorite impacts, or tectonic activity (“Marsquakes”). Both of these explanations have limitations when it comes to explaining observed slope streaks. What’s more, slope streaks have been found to climb over obstacles in many instances, which is not consistent with liquid-driven displacement. Similarly, the dry mechanism explanation also suffers from a number of inconsistencies and challenges when considered on its own. To shed further light on this, the team investigated an “wet analog” site in Salar de Uyuni, an Andean region in southwest Bolivia. This region, which is the largest salt flat in the world, experiences similar atmospheric and surface conditions as the equatorial region of Mars. This results in seasonal brine flows where chloride and sulphate salts become liquefied and create slope streaks. Essentially, salt water or liquid flows could explain many of Mars’ slope streaks, but certain inconsistencies demand further research. Over time, we may learn that other mechanisms are involved, which could range from subsurface features to specific seasonal changes. Before we can send astronauts to the surface Mars, or contemplate creating a permanent human presence there, we need to know where to step and what to avoid! I sure wish that some sort of linear scale was transposed on/with the opening photograph. It would be terrific to have some frame of reference for what distance is shown in that image. Not a word about it in the article, quite odd. If anyone learns of a scale for that photo please include it as a reply, for the sake of curiosity. Many thanks, great reference. With my handy caliper and by my scaling of the photo that feature is 650 plus meters. Look east between 90 and 120 degrees, the longest of those features is exceeds 850 meters. Whatever these features are, there seems to be many more in varying stages of contrast. How I envy the future human explorers of that world.